The almost complete silence of the motors used in electric cars may pose a hazard to inattentive pedestrians. As a result, starting in summer 2019 all new electric and hybrid vehicles will have to be equipped with an acoustic warning system. 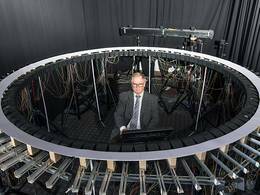 Psychoacousticians at the Technical University of Munich (TUM) are developing the corresponding sounds. It's supposed to sound similar to a vehicle – but not exactly the same as a diesel or gasoline-powered vehicle. The specifications for an Acoustic Vehicle Alert System warning sound that electric and hybrid vehicles will have to emit starting in the summer of 2019 are fairly general. Although playing a musical piece is not allowed, the nature of the sound with which individual approaching vehicles will warn pedestrians is being left up to manufacturers. One example of how the signal should sound can be found on the Internet page of the United Nations Economic Commission for Europe (UNECE): The listener is immediately reminded of a spaceship taking off or an effect from a science fiction series. In Europe the warning sounds are required for e-vehicles travelling at speeds of 20 kilometers per hour or less. The sound created by the tires on the road surface is considered adequate for vehicles travelling at higher speeds. Hugo Fastl, Professor at the TUM Chair for Human-Machine Communication, researches the basics of sounds design for electric cars. And although the sounds are still being kept secret, Fastl can reveal one thing: Each company wants its own branding, a sound which is characteristic of the car in question. "After all, right now a BMW also sounds different from a Mercedes or a Porsche – and that's supposed be the case with e-cars as well." How exactly is a sound like that developed? "First we have a basic sound to which we assign a pitch," says Fastl. Here the researchers work with medium-range frequencies: "Very low frequencies are difficult to produce," says Fastl. "This would require very large speakers on the car." On the other hand, elderly people can no longer perceive frequencies that are too high. Pitch can also indicate how fast the car is driving, for example with the sound rising in pitch as the automobile accelerates. Another sound property is timbre. "It's like in music: You can play the first notes of a Mozart symphony on a smartphone in such a way that everyone recognizes the melody," says Fastl. "But it doesn't sound so great. When the same notes are played by a chamber orchestra with ten musicians, it sounds much better. And a full orchestra with 50 people can play the music to sound just the way the composer intended it to sound." Nevertheless, Fastl and his team don't work with an orchestra, they generate the timbre of the sounds on the computer. Here they use a sound "construction kit" which they conceived and programmed themselves to develop target group-specific sounds. "It's a computer that can generate a wide range of sounds for use as ingredients, based on algorithms we developed ourselves." The sound machine resembles a mixing board in a sound studio. Its controls are used to create a synthetic sound which is then processed and adapted according to the results of listening tests conducted with human subjects. In addition to frequency range and timbre there are several other particularly important properties when it comes to automotive sound design, for example roughness. Roughness is determined by the speed of changes in a sound's volume. Particular roughness is created when the volume changes something like 50 to 70 times per second. "Roughness in a sound is perceived as especially sporty," Fastl explains. "A Ferrari without roughness would be very hard to sell." Special interior sounds are being designed for e-vehicles as well, even though there are no applicable regulations. The actual sound created by an electric motor could remind the driver of a tram; the interior sounds are tailored to the right target group just as the external sounds are. "Anyone who drives a 7 Series BMW will want to have peace and quiet," Fastl points out. "On the other hand Porsche drivers will want to be able to hear their investment at work." And presumably pedestrians and those living and working close to streets don't want to be overwhelmed by traffic noise. "For 20 years the objective has always been to make cars quieter," says Fastl. "Now things are in part too quiet and we have to get louder again." Nevertheless, Fastl advises against doing away with all the advantages of the low-noise electric vehicle: "More and more cars with automatic pedestrian detection will be coming onto the market. We recommend that the e-vehicle only transmit sounds when a pedestrian is in the vicinity."